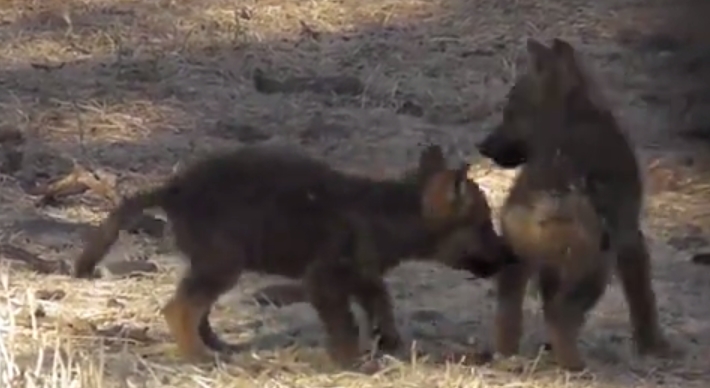 What better way to enjoy a day than with a video of wolf pups wrestling? The California Wolf Center is dedicated to the recovery of wolves in the wildlands they once roamed. They envision a landscape where wolves thrive in healthy ecosystems and wolves and people successfully coexist. They accomplish their mission through: Conservation: partnering with stakeholders to implement proactive solutions that enable wolves and people to successfully share the landscape and leading the way in endangered species recovery programs. Education: increasing awareness and understanding of wolves through engaging educational programs and public outreach. By learning factual information about wolves, people come to understand that this highly social and intelligent animal also plays a key role in the functioning of a healthy ecosystem, and we learn to coexist with an animal we once feared. Responses to "Your Epic Cuteness For The Day: Baby Wolf Puppies Playing (Video)"